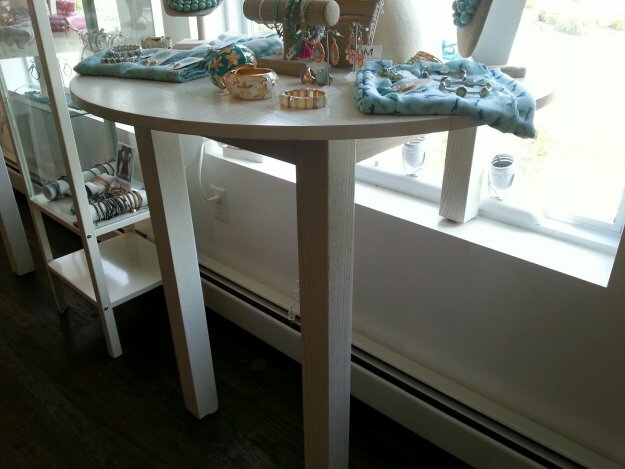 After a Sunday drive through Pennsylvania and Connecticut, we dropped in on Retail Speaks member, Ann Foley-Collins of Glee Gifts in Mansfield, (Boston) MA. Her location in a large regional mall area is very visible and she carries several key lines of gifts that are customer draws. In business for a number of years she is keenly aware of sourcing strong lines to replace some of the trendy hot lines that may be fading in popularity. Takeaways – One noteworthy observation is that similar to many other independent retailers we have visited, her success was keenly dependent upon the dedication of a key employee. Not to mention a good location! We then headed up to visit “The Frame Guy”, aka Harry Gaston of Gaston Framing & Art in Shrewsbury, MA. This outgoing framer and diligent business owner recently purchased an exisiting frame shop and converted it to his second location. In an adjacent community that has its own identity, this enables him to share his advertising and marketing benefiting both locations. While visiting we were able to witness one of his hosting art classes for the youth – this creative marketing helps reinforce his brand and brings in family and parents who might otherwise not visit his shop. Harry is perhaps best known for his agressive package pricing on custom framing – Gaston Great Deals. 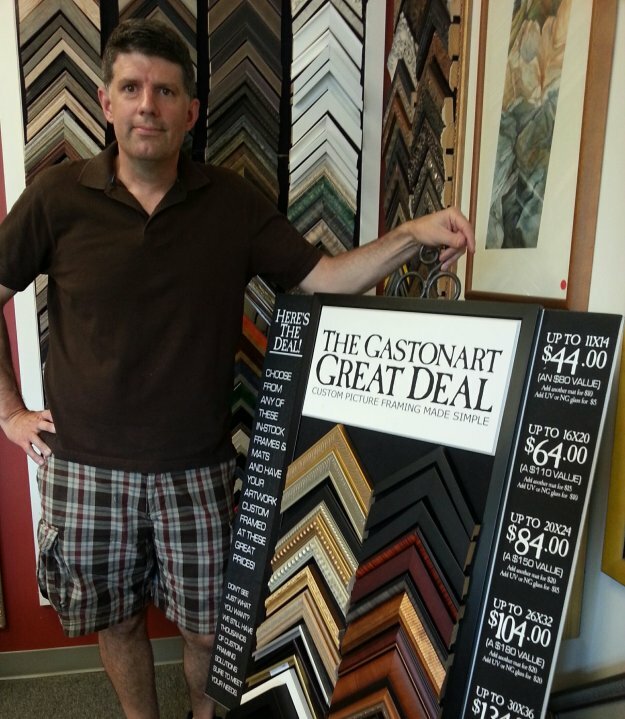 Harry Gaston of Gaston Frame & Art in Shrewsbury, MA showing his Great Deals display. Takeaways – Fortitude and passion combined with creative pricing options can definitely retain potential customers who frequent Gaston Framing & Art. Onto Worcester, Mass, we stopped at Framed in Tatnuck, owned by picture framer Cliff Wilson. Cliff has a shop that defines great innovative use of space. His success is also attributed to his adoption of the Frugal Framing concept that Harry uses at Gaston’s – in fact, Cliff makes over 60% of his sales in this area, and has seen an increase of sales volume every year during the recession! No small feat – but it should be noted that this probably has happened due to a key employee, in this case Amanda Schall. Amanda has successfully sold closed corner frames to multiple customers in the past year. 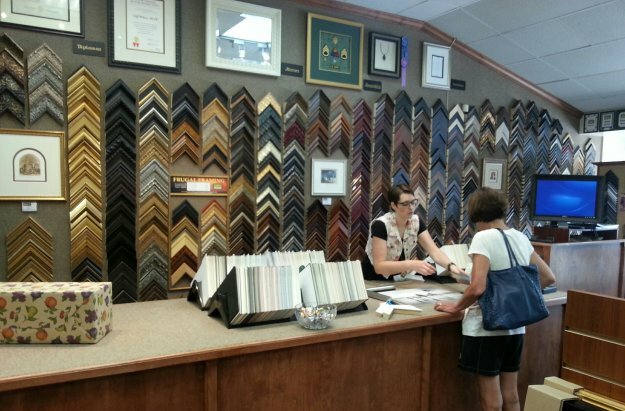 Amanda Schall with a customer – Note the well-organized and broad selection of moulding corner samples from Frugal Framing to high-end closed corner frames. Another reason that this frame shop is so productive is due to great use of space and organization. Cliff is seen below in part of his back room, his “dirty area” where he cuts moulding. Purchasing all length, he stocks an amazing amount of inventory in tight quarters. 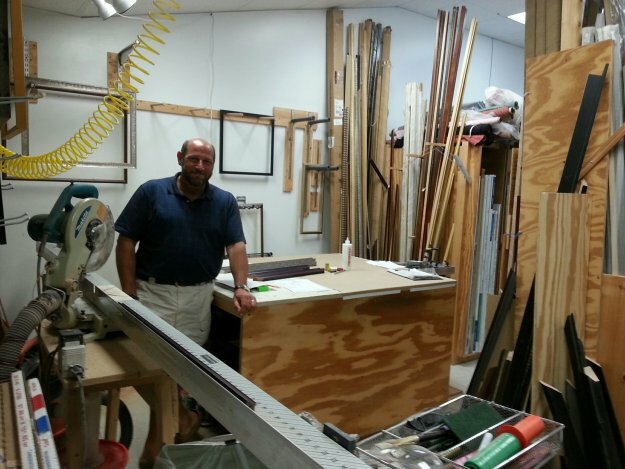 Cliff Wilson of Framed in Tatnuck stands in his moulding cutting room. 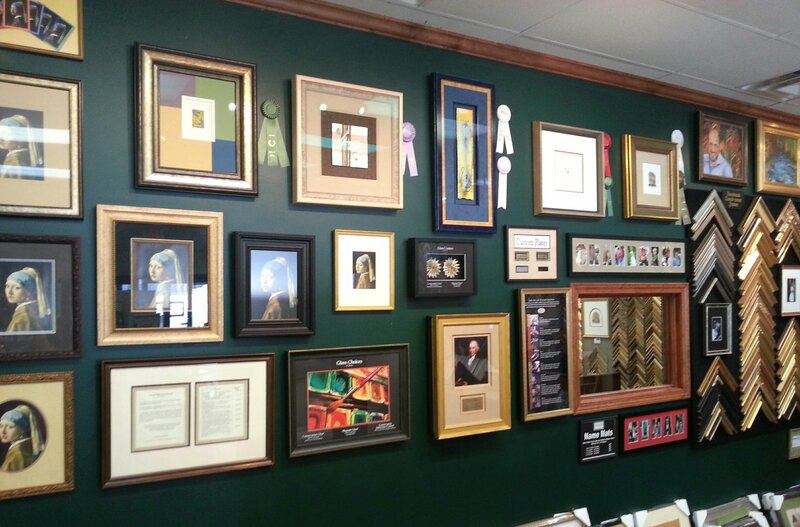 Award winning framing designs are complimented with industry comparison samples for glass, document two sided encapsulation framing and other creative options – Framed in Tatnuck, Worcester, MA. Takeaways – Key employees are still showing up to be an element to success, but so is passion to your core business as demonstrated by Cliff and Harry. It is also important to explore all options that complement your business even if they might prove unsuccessful – both framers shared with us not only ideas that meshed well with their businesses but also some that did not provide sales or increase traffic. Our last stop before the 4th of July weekend…family time… and some World Cup football matches was in Middleton, MA where we stopped in on another Retails Speaks member Liz White who is the owner of Mason & Madison. This gift shops specializes in personalized gift ware and is situated in a historical free-standing building that dates back to 1714. Liz has her building divided into 6 theme rooms catering to baby gifts, jewelry, invitations, personalized engraving, soaps & lotions etc. Her background working with corporate clients has directed her toward inventory management organization and embracing POS software. One comment she shared resonates with custom framers as well as gift shop owners; Affluent customers continue to be a key to success despite our attempts to reach to all clientele. We have visited many retail gift boutiques and picture frame shops and galleries, where the entrance is impressive, the interior spectacular and even the back room neat and organized. 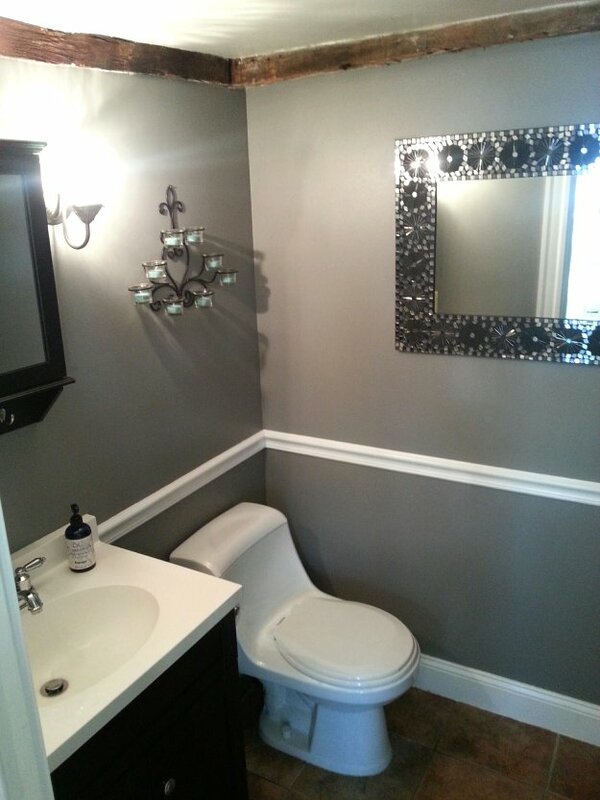 But then one visits their vanity or privy….and finds it slightly less than appealing – what a let down. Regardless if used for staff only or open to customers, retailers should recognize that not only does a pristine and nicer bathroom help maintain your professional image, but it also provides you with additional retail and marketing potential. Liz White sees the value quite clearly. Pristine vanity at Mason & Madison in Middleton, Massachusetts. This tells your customer that you care about the little details. 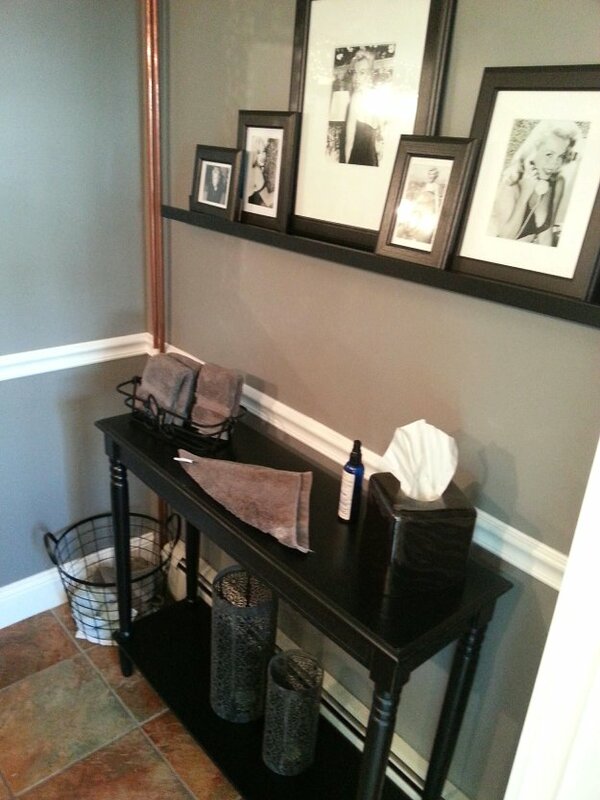 A vanity also provides an opportunity for additional marketing – Mason & Madison in Middleton, MA. Takeways… Mason & Madison, named after her two children operates an extremely well-organized and professional business. It was truly encouraging to see another independent shop owner doing everything professionally and serving the public well. It is a business like this that customers will bring their friends and family into – the serious shoppers are proud to share with others the businesses that they make theirs and this is one of those shops. 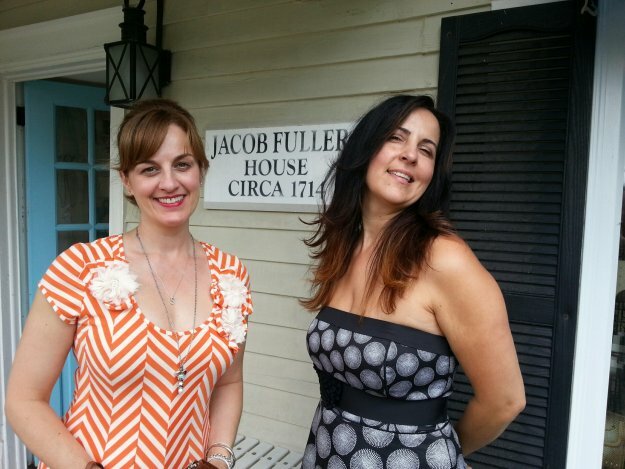 This entry was posted in Busman's Holiday - Road Trip on 5 July, 2014 by John Ranes II, CPF, GCF. Road Trip 2014… Back in Ohio!